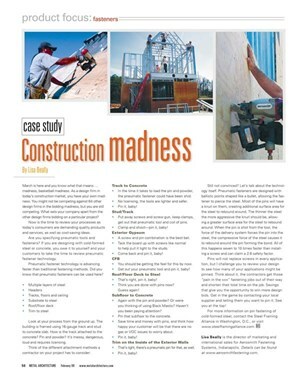 Aerosmith® Fasteners Featured in "Metal Architecture"
In the February 2009 issue of Metal Architecture, a case study discusses ways to cut costs as the busy construction season begins to ramp up. 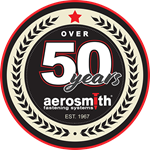 What better way to be competitive when going against tens of other bids than being able to keep your costs low through speed and efficiency with Aerosmith® tools and fasteners. This case study urges readers to consider pneumatic fastener technology and its various applications (track to concrete, stud/track, exterior gypsum, CFB, roof/floor deck to steel, subfloor to concrete, and trim). Contact us today to see what solutions we have to your challenges!